This two-word phrase sounded familiar, but I could not recall when I had heard it previously. For some reason, it wormed its way into my brain. 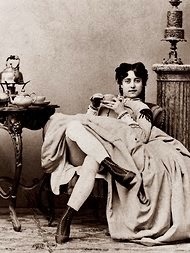 The meaning of “easy peasy” is immediately obvious: the word “peasy” amplifies “easy,” even though the literal meaning of “peasy” is “the disagreeable taste of very fresh green peas.” The word is not used for its literal meaning, but simply because it rhymes comfortably with easy and gives it a new implied meaning. The two words together are, when first heard, a breezy (light, fresh, informal) way of saying something is more than just easy. We might say the two words together are “super duper,” a similar construction of two words. Of course, when the two-word phrase wormed its way into my consciousness, I started hearing it more often. Apparently the two words have caught the attention of advertising writers. Last week when watching the Seattle-San Francisco football game, I heard the words “easy peasy” in three different commercials, including in a song sung by a postman happily delivering priority mail, which is, as we all now know, the “easy peasy” way to return gifts we do not want. (http://www.easypeasyfoods.com/ ), easy peasy shoes (http://www.easypeasy.fr/uk/index.php), and several easy peasy blogs. Also there are many easy peasy diets, including an easy peasy paleo diet (http://easypeasypaleo.net/). There is an easy peasy computer operating system (http://www.geteasypeasy.com/). And you can even buy an easy peasy pea from Burpee. O.K., I admit that I missed the easy peasy phenomenon until it came to television. Given the evident trend in the use of the phrase, I suspect that it will not be long before we are inundated with commercials showing attractive young people dancing frenetically as an announcer or a song repeatedly tells us how “easy peasy” a product is. At that point, if it has not already, “easy peasy” will cross from being breezy to being cheesy. It will be so trite, dull, and tired that people will cringe when they hear the phrase. Yes, just as “just sayin’” quickly crossed from breezy to cheesy a couple of years ago, the same is happening to “easy peasy” because of its overuse. My experience with easy peasy reminds me that our brain’s relationship with words is a strange one. We hear and speak words in our vocabulary with great ease, rarely noticing them as individual entities. Then, we encounter a new word or phrase that surprises us or catches our imagination. We often incorporate it into our conversation, as do countless others, showing how hep or tuned in or cool we are; then the word or phrase quickly becomes cheesy through repetition. When we use it, and people hear it for the 1000th time, we catch a scent of scorn or sympathy from them. Hey, “what happens in Easy Peasy land, stays in Easy Peasy Land”: such phrases quickly lose their freshness. Sometime a word can do more than worm its way into our consciousness: it can scare us when it keeps popping up in unexpected places. I call this the “Olsen Effect.” You have probably experienced it. It goes like this: you hear a worm word or phrase – one that penetrates your consciousness – and then in a short time, you hear it, read it, and see it repeatedly, as if it were stalking you. My defining experience with the “Olsen Effect” came shortly after I moved to Birch Bay. I was looking for the quickest route from Birch Bay to the town of Ferndale and soon found that it was “Olsen Road.” Right after that discovery, I and my fellow traveler, Natalia, started noticing the word “Olsen” everywhere we turned. We passed the Olsen Realty company. an Olsen yard sign was in most yards to promote a man running for a county office. A man named Olsen was heralded in the headlines in the local newspaper for his civic actions. A young Olsen hit a home run to lead his high school team to victory. On it went, day after day: Natalia and I would encounter an Olsen in the most unlikely places at the most unlikely times. O.K., you might say, Northwest Washington was settled by Scandinavians, and Olsen is a common Scandinavian name. So, being “Olsenized” should not have been a big surprise. True, maybe. But what about this: in the midst of the Olsen phenomenon, Natalia and I traveled to Vienna, Austria. After a few days there, we did some shopping and she, after substantial searching, found a sweater she liked at the Steffl department store on Kärnterstrasse. Taking it to the cash register, we glanced at the label and both of us noticed at the same time that it said “Olsen.” We had to muffle our screams to avoid getting kicked out of the store. By that time, “Olsen” had changed from a breezy word to a cheesy one. We had had enough of it. Another, but lesser example of the Olsen Effect is a word I noticed late last year in a short story by Dorothy Thompson, the journalist who was the second most famous woman in the United States in the 1930s (behind Eleanor Roosevelt). Researching her years in Vienna from 1921 to 1925, I ran across an unpublished short story she wrote in 1922 or 1923. In it, she described a very attractive woman character as a “light-o’love.” I had never read or heard this phrase before. Consulting a dictionary, I learned that the word was first used in 1589 and was in more common use in the 19th century. Its meaning is (1) prostitute or (2) lover, paramour. Since this second meeting with this word, I have run across it three or four other times. In each case, the word was used in a discussion of Schnitzler and his plays. I think that if I use the word in some discussion, it will still be a breezy, not a cheesy, word. It still has the power of freshness. 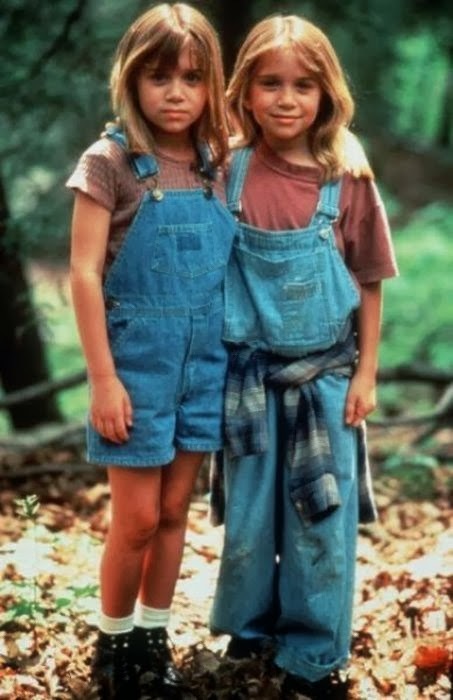 Another note on words, Olsens, and brains. A few months ago, I was reading Barry Schweitzer’s autobiography, Bootlegger’s Son, when I stumbled upon an intriguing, unfamiliar word. I was reading the book mainly to find out more about Switzer’s upbringing in Arkansas. He had a rough childhood in Crossett before playing for the Arkansas Razorbacks and then becoming one of the most successful, and disliked, football coaches in history. In describing his childhood, Switzer described his father as a “rounder.” I did not know the meaning of the word (and did not recall seeing it previously), but knew it was not a compliment. The dictionary told me that it has a very specific meaning: someone who frequents bars and is often drunk. Good word, I thought, though I do not know any rounders. 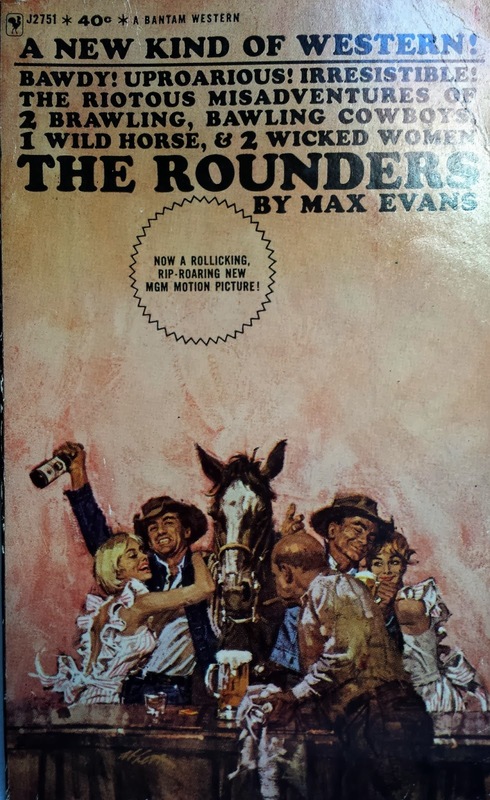 Fortunately, I have found no other rounders around me and the word is still a fresh one in my vocabulary. I look forward to using it in a conversation some day soon. Here is one other phrase – in this case a colorful, descriptive phase – that recently wormed its way into my brain, then started regularly appearing in the books I was reading. In an e-mail communication from a man who lived in a Vienna as a child in the late 1920s and early 1930s, he described a building as being “without eyebrows.” The phrase struck me as a vivid description of an unadorned building. In Vienna, a building “without eyebrows” would differ from the ubiquitous baroque-influenced buildings that most certainly are decorated around the windows. 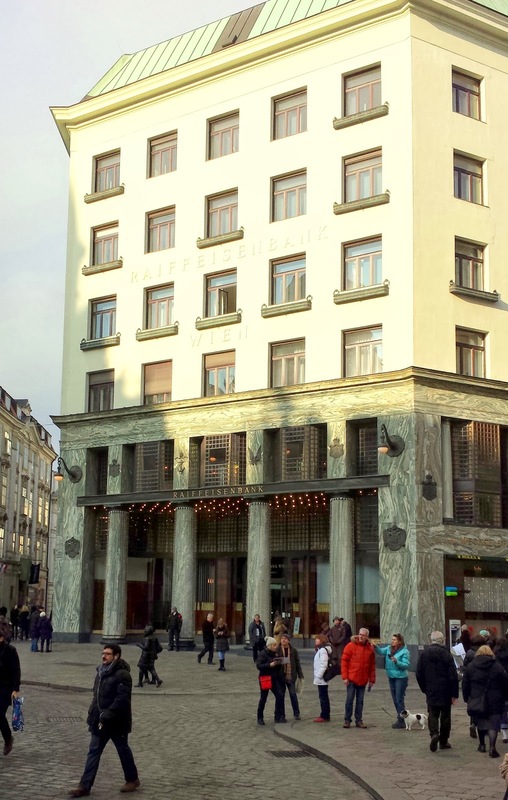 Not long after the email, I read (again in Hofmann’s The Viennese) about the famous “house without eyebrows” designed by architect Adolf Loos, who hated superfluous ornamentation of buildings. This multi-story building, was erected on Michaeler Platz, which lies at an entrance to the huge Hapsburg castle complex. When someone exited the complex into the inner city, the building was in the line of sight. Erected between 1909 and 1912 for the tailoring firm Goldman & Salatsch, the building caused a sensation that we have difficulty nowadays to understand. The “Loos House,” with its plain walls and windows without any decoration, stares at the neo-Baroque façade of the Michaelertrakt of the Hofburg and its heroic statuary, put up only twenty years earlier, as if in defiance. After reading about the “house without eyebrows” in Hofmann’s book, the term kept popping up in other books that I was reading, admittedly about fin de siècle Vienna and the Austrian First Republic. 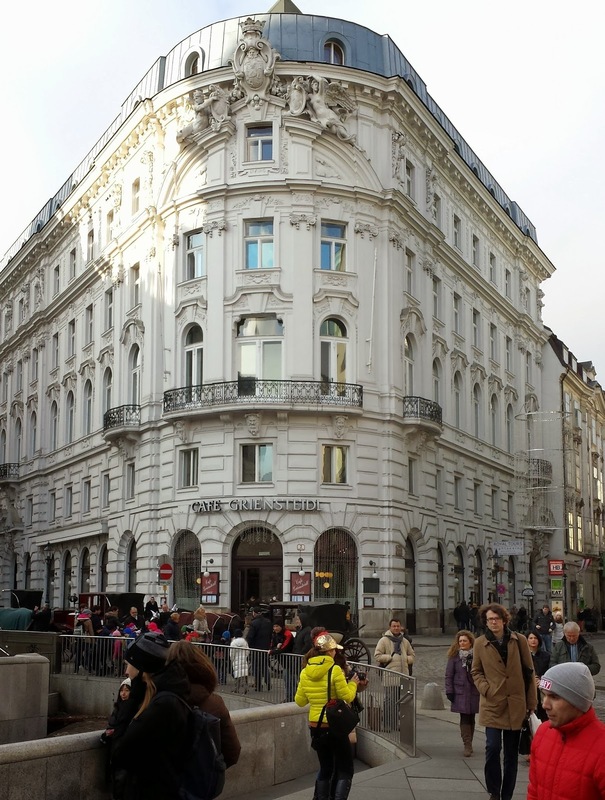 In the other books, I learned that Emperor Franz Joseph had been outraged by this building, a “modernist monstrosity.” Reportedly, the old man refused to ever use the Michaelerplatz entry gate again. I am not sure if the author of one book about architecture in Vienna was accurately describing the events leading up to the construction of the Loos House, but according to him, when the owner of the Goldman & Salatsch company told Loos – who had lived three years in the United States – that they wanted him to design a building that would make them famous, he replied with a breezy smile. “Easy peasy,” he said.